Chen, C.-Y., Chong, P.P. : Software engineering education: A study on conducting collaborative senior project development. 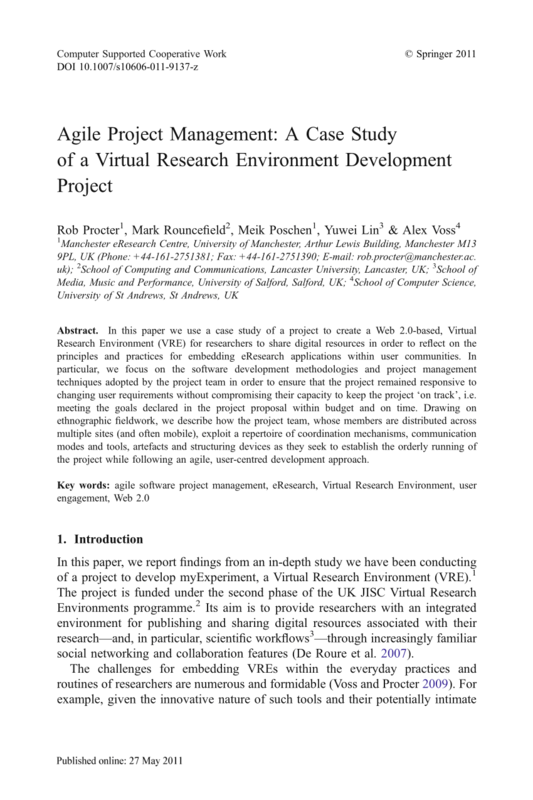 Journal of ... (accessed August 30, 2012) Procter, R., Rouncefield, M., Poschen, M., Lin, Y., Voss, A.: Agile Project Management: A Case Study of a Virtual Research Environment Development Project. ... and A. Voss, 2011, Agile Project Management: A case study of a virtual research environment development project, Computer Supported Cooperative Work, 20, 197-225. Renslow, M., ed., 2012, ASPRS Airborne Topographic Lidar Manual, American Society for Photogrammetry & Remote Sensing, Bethesda, MD, 485 pp.